Cheer your granmother with our nice bouquets. We create many different flower composition specially for your beloved people. If you are going to congratulate your granmother, pay attention to the classical bouquets in the warm tones. Try to choose the flower composition in the classic style. 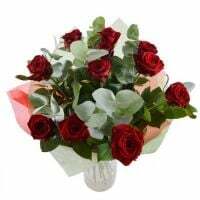 The most of adult woman like posh bouquets of elegant flowers as red roses, orange gerberas, pink orchids. Traditionally we give bouquets of carnations and chrysanthemums for youe grandmother. These are a good choice to, but remember that the bouquet should not look poorly. Carnations in the gamma from red to green. Also you should remember that the grandmother will be glad to take some package of sweets. For example, the perfect gift for her is a natural flower bouquet and a box of chokolate candies.